Looks like the winners were Vulcan and Cerberus; but I haven't seen anything official in naming these two moons! Unless significant new hazards are found, expect NASA’s New Horizons spacecraft to stay on its original course past Pluto and its moons, after mission managers concluded that the danger posed by dust and debris in the Pluto system is less than they once feared. orin stepanek wrote: Looks like the winners were Vulcan and Cerberus; but I haven't seen anything official in naming these two moons! Sounds interesting BMAONE23! Is there a story? detection of Pluto’s largest moon, Charon, cleanly separated from Pluto. NASA’s Pluto-bound New Horizons spacecraft, using its highest-resolution telescopic camera, has spotted Pluto’s Texas-sized, ice-covered moon Charon for the first time. This represents a major milestone on the spacecraft’s 9½-year journey to conduct the initial reconnaissance of the Pluto system and the Kuiper Belt and, in a sense, begins the mission’s long-range study of the Pluto system. The largest of Pluto’s five known moons, Charon orbits about 12,000 miles (more than 19,000 kilometers) away from Pluto itself. As seen from New Horizons, that’s only about 0.01 degrees away. The spacecraft was still 550 million miles from Pluto – farther than the distance from Earth to Jupiter – when its LOng Range Reconnaissance Imager (LORRI) snapped a total of six images: three on July 1 and three more on July 3. LORRI’s excellent sensitivity and spatial resolution revealed Charon at exactly the predicted offset from Pluto, 35 years after the announcement of Charon’s discovery in 1978 by James Christy of the Naval Observatory. “In addition to being a nice technical achievement, these new LORRI images of Charon and Pluto should provide some interesting science too,” says New Horizons Principal Investigator Alan Stern, of the Southwest Research Institute. 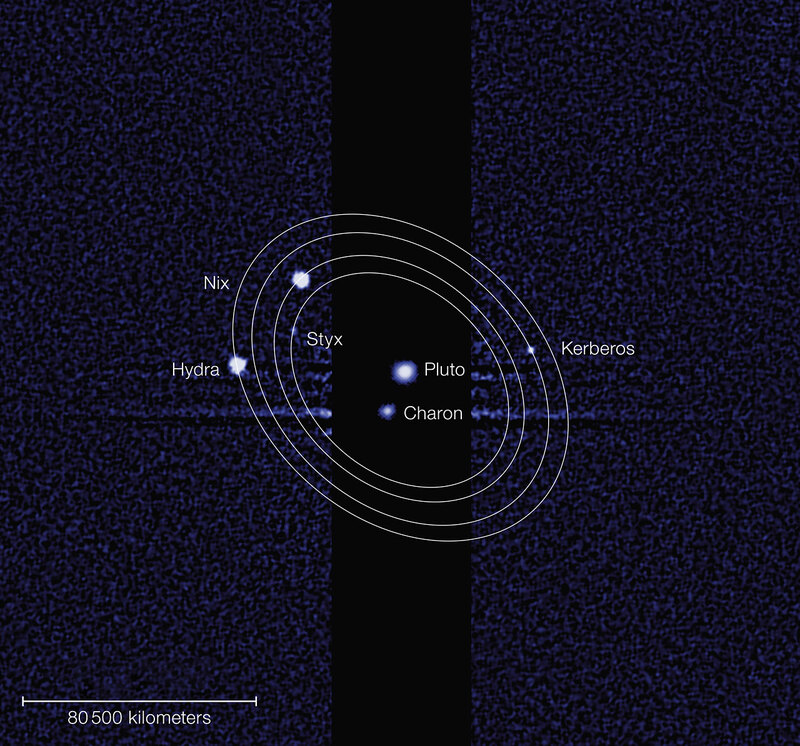 New Horizons is viewing Pluto and Charon at solar phase angles (the angles between the Sun, Pluto and spacecraft) much larger than can be achieved from observatories located on or near the Earth, potentially yielding important information about the surface properties of Charon and Pluto – perhaps the existence of an overlying layer of fine particles, for example. Nice post bystander; I was under the impression that studying Pluto with camera would begin when the probe was within 200 days away! Anyway it is now 730 days away or exactly 2 years from goal! Seems that page is rather dated. The latest image is from March, 2007. <<A scientific conference sponsored by the New Horizons project to review everything known about Pluto and its satellites, their origin and evolution, and to hear informed scientific predictions about what New Horizons will find. More than 170 scientists registered for the five-day conference, which was held at the Johns Hopkins Applied Physics Laboratory in Laurel, Maryland, where New Horizons was built and from which it is now operated. The conference, "The Pluto System on the Eve of Exploration by New Horizons: Perspectives and Predictions," was covered by science press who attended and wrote and tweeted about it; it was extensively blogged by New Horizons Deputy Project Scientist Kimberly Ennico; and will result in a special issue of Icarus, the premier research journal of planetary science. I predict a string of nonsensical and emotional articles about Pluto's status as a planet overshadowing any new discoveries unless there's aliens with hovercars flying around the surface. I predict a string of nonsensical and emotional articles about there being aliens with hovercars flying around the surface. <<Ten years ago this week, the planet Mars reached made an exceptionally close pass of the planet Earth. This occurred on August 27th, 2003, when Mars was only 56 million kilometres from our fair planet and shined at magnitude -2.9. Such an event is known as opposition. This occurs when a planet with an orbit exterior to our own reaches a point opposite to the Sun in the sky, and rises as the Sun sets. In the case of Mars, this occurs about every 2.13 years. But [a myth also] arose in 2003, one that now makes its return every August, whether Mars does or not. You’ve no doubt gotten the chain mail from a well-meaning friend/relative/coworker back in the bygone days a decade ago, back before the advent social media when spam was still sorta hip. “Mars to appear as large as the Full Moon!! !” it breathlessly exclaimed. “A once in a lifetime event!! !” Though a little over the top, the original version did at least explain (towards the end) that Mars would indeed look glorious on the night of August 27th, 2003 … though a telescope. But never let facts get in the way of a good internet rumor. Though Mars didn’t reach opposition again until November 7th 2005, the “Mars Hoax” email soon began to make its rounds every August. Co-workers and friends continued to hit send. Spam folder filled up. Science news bloggers debunked, and later recycled posts on the silliness of it all. Now, a decade later, the Mars Hoax seems to have successfully made the transition over to social media and found new life on Facebook. No one knows where the Mars Hoax meme goes to weather the lean months, only to return complete with all caps and even more exclamation points each and every August. Is it the just a product of the never ending quest for the almighty SEO? Are we now destined to recycle and relive astronomical events in cyber-land annually, even if they’re imaginary? Perhaps, if anything there’s a social psychology study somewhere in there, begging the question of why such a meme as the Mars Hoax endures… Will it attain a mythos akin to the many variations of a “Blue Moon,” decades from now, with historians debating where the cultural thread came from? -Mars reaches opposition about every 2.13 Earth years. -Due to its eccentric orbit, Mars can vary from about 56 million to over 101 million kilometres from the Earth during oppositions. -Therefore, Mars can appear visually from 13.8” to 25.1” arc seconds in size. -But that’s still tiny, as the Moon appears about 30’ across as seen from the Earth. You could ring the local horizon with about 720 Full Moons end-to-end, and place 71 “maxed out Mars’s” with room to spare across each one of them! -And although the Full Moon looks huge, you can cover it up with a dime held at arm’s length…. Try it sometime, and amaze your email sending/Facebook sharing friends! - Mars NEVER gets large enough to look like anything other than a star-like point to the naked eye. -And finally, and this is the point that should be getting placed in all caps on Facebook, to the tune of thousands of likes… MARS ISN’T EVEN ANYWHERE NEAR OPPOSITION in August 2013!!! Mars is currently low in the dawn sky in the constellation Cancer on the other side of the Sun. Mars won’t be reaching opposition until April 8th, 2014, when it will reach magnitude -1.4 and an apparent size of 15.2” across. What’s a well meaning purveyor & promoter science to do? Feed those hungry brains a dose of reality. There are real things, fascinating things about Mars afoot. We’re exploring the Red Planet via Mars Curiosity, an SUV-sized, nuclear powered rover equipped with a laser. The opposition coming up next year means that the once every 2+ year launch window to journey to Mars is soon opening. This time around, the Mars Atmosphere and Volatile EvolutioN (MAVEN) mission and, just perhaps, India’s pioneering Mars Orbiter Mission may make the trip. Launching from Cape Canaveral on November 18th, MAVEN seeks to answer the questions of what the climate and characteristics of Mars were like in the past by probing its tenuous modern day atmosphere. i can't recall how many time i recieved that Mars email! Knock on wood; so far I haven't recieved it yet this year! orin stepanek wrote: i can't recall how many time i recieved that Mars email! Knock on wood; so far I haven't recieved it yet this year! http://pluto.jhuapl.edu/mission/whereis_nh.php Round trip light time between Earth and New Horizons is now at 7&1/2 hours! Round trip light time between Earth and New Horizons is now at 7&1/2 hours! Hard to be impressed after Voyager I (~35 hour round trip light time). 5.3 AU distance to Pluto is more relevant perhaps. neufer wrote: Hard to be impressed after Voyager I (~35 hour round trip light time). 35 hour is a long time to wait for a reply! Almost a day and a half! Nice url on didtance neufer! It surprised me that this web page was changed; only showing the time coundting down! Site used to show time in space counting! I like the format though!